Used effectively, colour can be one of your most powerful design tools. It can convey mood and emotion and successfully engage your viewer. 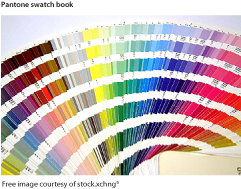 Your colour choice can create an environment of warmth and serenity or one of clinical coldness. While you have freedom to develop your own project colour scheme, there are some basic rules guiding the formation and use of colour. DO familiarize yourself with the colour wheel. This is a basic colour tool designed to help the user make successful colour combinations. 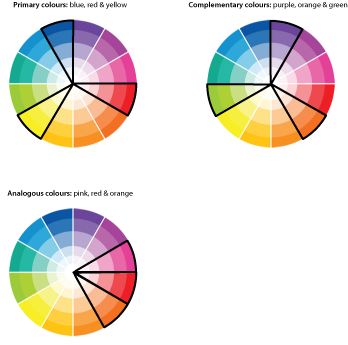 The most common wheel uses 12 RGB colours. You may also achieve more subtle results by working with different tints and shades of the same colour. There are also established colour harmonies. Some are shown in the diagrams below. Complementary Colours: These are colours that are opposite each other on the colour wheel. They tend to create vibrant colour combinations and are effective if you want an element of your design to stand out. Analogous colours: These colours are found directly next to each other on the colour wheel and usually create a calming, harmonious effect. Make sure that there is enough contrast between the colours when using analogous colours. These are just two of the established colour schemes. Try not become too preoccupied with technicalities as it is also important to have fun and experiment with your colour schemes. Bear in mind that your choice of colour, as with images and type, must always support your content and help convey your message. When using colour with type, make sure it doesn’t detract from its legibility. Consider your audience and their experience. The aim is always to enhance the communication and not make it more difficult.